This colorful necklace is from a 1939 booklet called "Costume Jewelry You Can Easily Make". I have modified the instructions to be clearer and to work better with modern materials. Step 1: Cut 7 - 10 strands of yarn, depending on the thickness of the cord wanted. I used 7 strands for my necklace. The length should be twice the finished length, plus about 10 inches. Knot the strands together at both ends. Step 2: Get someone to hold one end, while you hold the other, stretch the yarn tautly and twist it by inserting a pencil through the yarn at one end and rotating it in one direction. The knotted end of the cord with ball button attached. 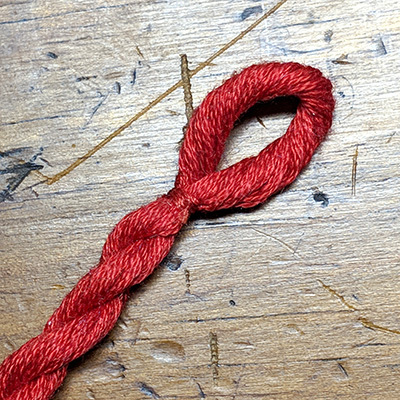 Step 4: Turn back the knotted ends 1/2 inch and conceal the knots with embroidery or sewing thread by coiling it around the knots and tying in place. Sew the ball button to the end. The loop end of the cord with closed off loop. Step 1: Make 4 small pom-poms one of each color. Do this by wrapping the yarn about 40 - 70 around the tines of a regular dinner fork. (The more you wrap the yarn, the fuller the pom-pom.) Cut 5 inches of yarn or embroidery thread of the same color and thread beneath your yarn wraps between 2nd and 3rd fork tine. Tie the yarn bundle together as tight as you can. Slip the yarn bundle off the end of the fork and snip through all the loops of yarn and fluff the pom-pom with your fingers. Trim any uneven ends, but do not cut the thread that tied the bundle together. Step 2: Attach the pom-poms closely to the cord by knotting the “ties” to the cord. Trim off any extra length of the ties. Step 3: Add a bit of glue to the inside edges of the thimbles and insert the pom-poms.